Professor Melody Clark is an Individual Merit Promotion Scientist (IMP) and Project Leader at BAS. She has a genetics degree and PhD from London University. 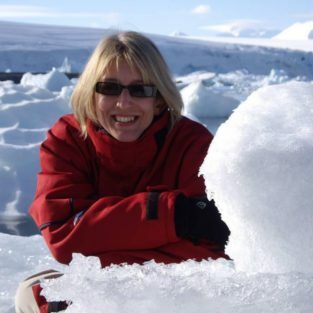 After a string of short-term post doc contracts working on areas ranging from plant chromosomes to the high-profile Japanese pufferfish genome project, she finally landed a job as Project Leader at the British Antarctic Survey (BAS) in August 2003. She currently leads the Adaptations group, which studies two main areas: how animals adapt to the extreme cold and how they may react in the face of predicted climate change, also how molluscs produce their shells (essential protection if there’s a large iceberg in the area for the Antarctic species, not really a problem for the temperate species we study). Grant income is currently running at over £7M in the past 10 years, with the most recent significant grant being PI and Co-ordinator of the EU Marie Curie Initial Training Network FP7-PEOPLE-2013-ITN Project no: 605051: CACHE: CAlcium in a CHanging Environment, from November 2013 with a budget of circa €3.7M. In 2007 She was awarded the Senior Prize for Outstanding Women in Marine Biological Sciences Prize, awarded by the EU-FP6 Network of Excellence, Marine Genomics Europe. My research interests include the development of cross-disciplinary studies into the Environmental Genomics of Antarctic organisms and molecular analyses of marine organisms’ capacity to cope in stressful environments over timescales from days to years. Stresses include heat, hypoxia, ocean acidification, disturbance and sedimentation. These are being studied in a range of taxa, feeding guilds and developmental stages, with personal research concentrating on their limited heat-shock (stress) response and the application of ‘Omics technologies to Environmental Science. Newly developing projects include more impact-orientated research investigating calcium regulation in marine molluscs through the CACHE (Calcium in a Changing Environment) Marie Curie ITN. This network involves investigation of biological calcification processes and their exploitation via biomimicry approaches. I also am developing approaches to study cold adapted enzymes in a variety of polar species, with the potential for societal gain. Verde, Cinzia, di Prisco, Guido, Clark, Melody S., Peck, Lloyd S., Lauro, Federico M.. (2015) Stresses on polar marine ecosystems: impact on key ecosystem functions and services. In: Sailing through changing oceans: Ocean and polar life and environmental sciences on a warming planet, European Science Foundation, 67-72. Lubzens, E., Cerda, J., Clark, Melody S. (eds.). (2010) Dormancy and resistance in harsh environments. Berlin, Springer, 300 pp. (Topics in Current Genetics, 21). Convey, Peter, Barnes, David K.A., Clark, Melody S., Hodgson, Dominic A., Peck, Lloyd S.. (2007) A holistic approach to understanding the biological impacts of climate change: Antarctica as a planetary warning system. Inside Agriculture, 2. 16-39. Bridge, P.D., Clark, M.S., Pearce, D.A.. (2005) A new species of Paecilomyces isolated from the Antarctic springtail Cryptopygus antarcticus. Mycotaxon, 92. 213-222. STATION SCIENCE: Baby its stressful down here!